You will notice coolant leaking from the front of your car or hear a strange noise from your engine. The water pump in your car's engine is designed to circulate coolant through the cylinder heads and main block to keep the engine from overheating while in operation. This pump is driven by a main serpentine belt or timing belt which rotates an impeller that is submerged in coolant in the front part of the engine. When the engine is cold and first starts up coolant is circulated within the block while bypassing the radiator allowing the engine to warm up to operating temperatures. 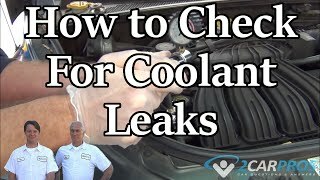 This coolant flow control is the job of the thermostat which blocks off the upper or lower radiator hose which controls when the coolant circulates. 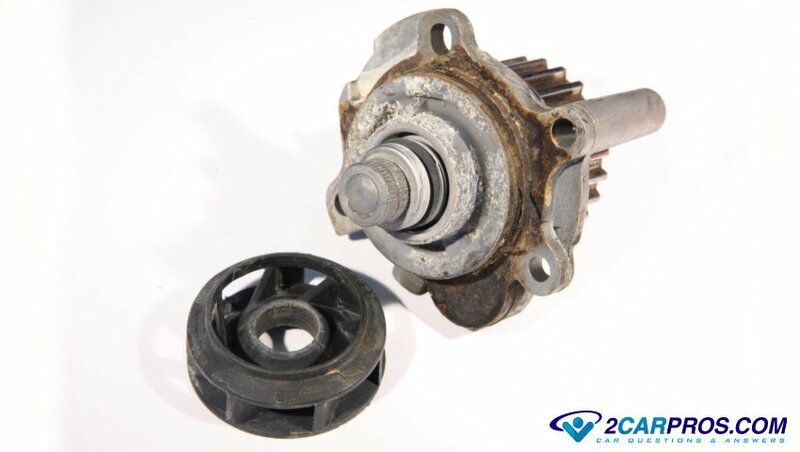 The water pump is designed with a weep hole to allow coolant to leak from its housing before it can reach the shaft bearing which will cause the shaft to lock up and stop turning. If this shaft locks up it will cause the serpentine belt to get thrown off which will render the car useless. It is typical for the pump shaft seals to leak while the engine is running and then stop leaking once the engine has been shut off and the pump stops turning. When the coolant level inside the engine diminishes it will overheat which can cause the block or cylinder heads to crack. It is difficult to replace the water pump seal by itself which is why in most cases the water pump must be replaced. To replace the pump seal a hydraulic press must be used which will cost more than a new pump. Because the engine is depended of its circulating coolant, if the operation of the pump fails to push coolant throughout the radiator, block and cylinder heads it will cause the engine to overheat. This will be noticed by the driver of the car by an elevated temperature gauge reading or a temperature warning light coming on. Steam might be present from under the hood or being omitted from the grill as the coolant boils out from the radiator and into the coolant reservoir. When the water pump bearings go out it will cause a squeaking, ticking or grinding noise while the engine is running. This is because the shaft bearings are trying to lock up within the pump housing. 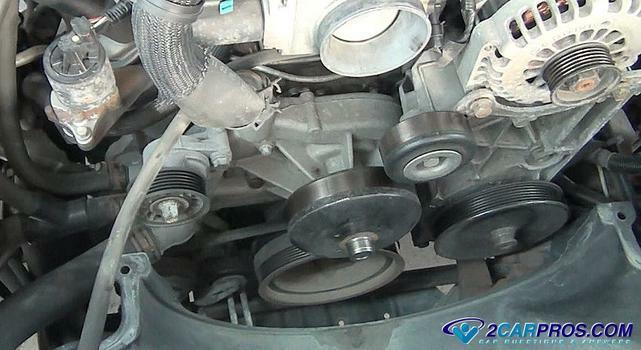 This bearing failure is due to the pressure being applied by the serpentine belt or the timing belt. some engine's even have a timing chain that drives the pump. As the water pump turns the shaft is forced to rotate upon the bearing rollers that are not turning which generate the undesirable noise. If this condition is not attended too the pump will lock up and cause the serpentine belt to snap or derail. 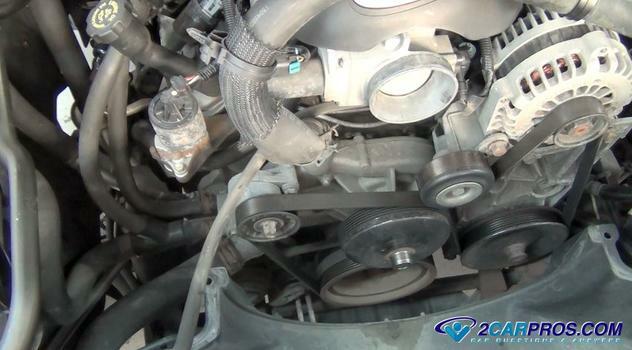 Below is a water pump being driven by the serpentine belt and the tension being applied by the belt tensioner. 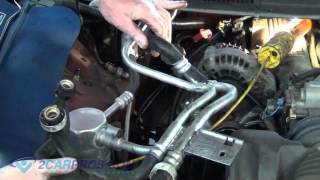 To check the water pump shaft bearings grasp the fan with the serpentine belt removed and move it side to side. There should be no play within the shaft bearings and the housing. When a water pump bearings are going out it will allow the water pump pulley to wobble and make squeaking or grinding noises while in operation. To check the bearing's condition, look straight down at the pulley and sight the alignment of the pulley with the other pulleys of the engine. If the water pump pulley is noticeably offset then you know the bearings are bad. Also grasp the pulley or use a large flat blade screw driver and to the move the pulley back and forth on its axis, it should have little to no play. Excessive play is an additional indication the bearings have failed.